If walking the dog at night on an unlit campsite is something you don’t particularly relish, here’s a gadget that might help. 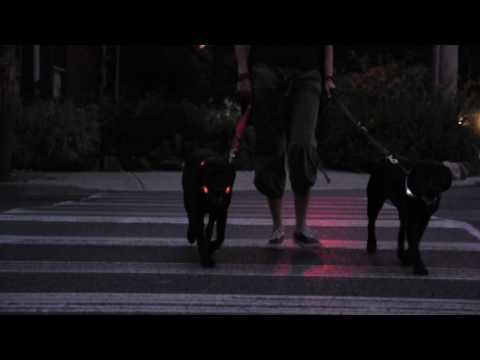 Called the Glowdoggie, it’s a battery-powered dog collar with built-in LEDs that glow brightly in the dark, making it much easier to see where your pooch has wandered off to. The collars come in a range of colours and sizes, are waterproof and are activated via a motion-sensor rather than a mechanical switch. The LEDs, which glow permanently rather than blink, have a rated lifespan of 150,000 hours and are apparently the same kind used in premium German cars. Glowdoggie is based in Canada and its site is packed with information about the collars. The German-made collars cost from £32 plus trans-Atlantic shipping, but they appear to be same as those sold by Leuchtie in the UK. These cost about the same, but delivery is a mere £3.50, so it’s a better bet for UK buyers.